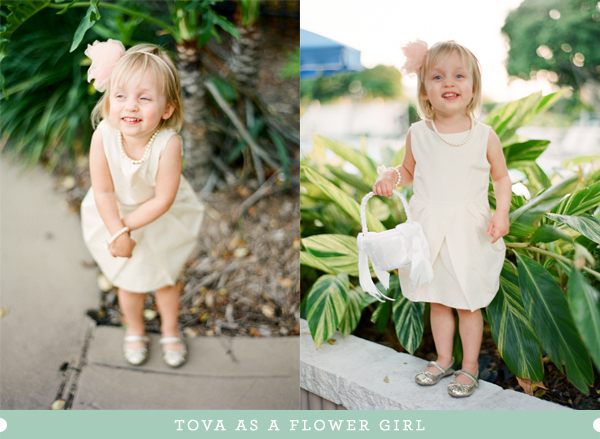 Yes, Tova referred to it as her wedding day the whole week (it was David's step-sister's wedding). "Are you coming to my wedding?" she would say to family members. It was adorable. She loved every moment of her beautiful ivory dress, big pink flower headband, gold sparkly shoes, and her pearls. The girl is obsessed with fancy. But most of all, she did an AMAZING job being a flower girl! Watch below! Note: Nearly positive this is Fuji 400H (my negatives are still packed) on Contax 645 with Planar T* 80mm f2 lens. Video on David's iPhone 4.